Hey all! 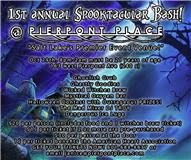 Please join us for our 1st annual Spooktacular Bash at Pierpont Place Friday October 29th from 8PM-2AM. Must be 21 and a portion of the proceeds goes to the American Heart Association. Discounted tickets are available prior to this event, contact Janice Boes- janice@pierpontplace.com for more information. Regular priced tickets available at the door. Costume contest with awesome prizes, delicious eats, oxygen bar and ice luge along with DJ Troy-can’t wait to see you all there!